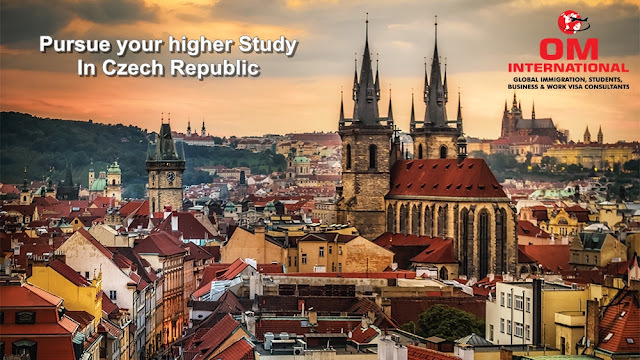 OM VISA Consultancy - Global Immigration, Students, Visitor, Business & Work VISA Consultants: Study in czech republic through OM INTERNATIONAL...!!! Study in czech republic through OM INTERNATIONAL...!!! For immigration aspirants, Om International plays a very important role in their successful settlement. OM INTERNATIONAL Visa Services equips them with vital information about the country even before the leave for abroad. This enables them to settle and find placement / establish a business quickly and easily. Migrating abroad and moving to prosperity is the most cherished dream of a large number of people in developing countries like India. We guide people to migrate to UK, USA, CANADA, AUSTRALIA, NEW ZEALAND and IRELAND. Assessment factors keep changing from time to time. (1) The oldest University in its field in the Czech Republic. (2) An almost one-hundred-years-long tradition of teaching. (3) An entrepreneurial spirit supported by scientific research. (4) All you need for study as well as for your free-time activities located at one campus. (5) Rich student life – you will find lifelong friends from all over the world. (6) Members of the International Students Club will make you feel at home here. (7) Wide selection of practically-oriented degree programs (from information technology to horticulture, from European forestry to international territorial studies and ecology). (8) Teachers from different countries and possibilities to study abroad including in developing countries. (10)The unique CEITEC MENDELU research institute and specialized workplace – Technologies Transfer Centre. (11)Internal grant agency supporting students’ participation in science and research. (12)Practical training at our own workplaces. (3) Located in Brno, the second biggest city in the Czech Republic. (4) University named after J. G. Mendel, the founder of modern genetics. (5) About 11,000 Students, of which 10% are, exchange students. (6) More than 300 partner universities abroad. (7) The oldest university campus in Brno surrounded by beautiful gardens and arboretum. (8) Detached workplace in developing countries. (9) Extensive library and magazine reading room with information centre. (10)All exchange students can be accommodated in hall of residence. (12)Sport activities centre offers more than 40 sport courses. (1) The second biggest city in the Czech Republic; 6th safest and 27th happiest country in the world. (2) Heap and pleasant life in a city of parks. (3) A favorable location in the heart of Europe – it takes you two hours to travel to Prague, Bratislava and Vienna by car. The journey to Budapest takes 3 hours, and to Krakow it takes less than 4 hours by car. The flight to Paris, Munich and London takes about 2 hours. (4) Equal rights for all citizens in the Czech Republic. (6) Safe public transport operating 24/7. (7) Multicultural student city with 14 universities and 90,000 students. (8) Brno Technology Park – a leading business and technology development project in Central Europe. (9) Headquarters of major international companies. (10)Free access to the job market for students in all accredited degree programs and for successful graduates. (11)South Moravian Innovation Centre in Brno – a Czech paradise for start-ups. (12)The largest trade fair city in Central Europe. The cost of living in the Czech Republic is quite low in comparison with other EU Countries. The average monthly cost of living is about 320-680 Euro (it depends on the individual student’s lifestyle) including accommodation, food, transport and entertainment, e.g. one load of bread costs approximately 1 Euro, one half-litre of beer also costs 1 Euro, the soup in the canteen starts at 0.2 Euro and the main course in canteen costs about 1.5 Euro. Students can choose between two types of accommodation in Brno – student hall of residence or private housing. MENDELU halls of residence in Brno and in Lednice offer accommodation in 1 to 4- bed rooms. There are 588 beds located directly on campus, while the others can be reached within 15 minutes by public transport. The price for accommodation is about 100 Euro per month. There are a lot of places to live in shared rooms or private flats in Brno. The cost of a single room in a student flat ranges from 160 to 240 Euro per month. A private flat costs about 400 Euro per month or more. OM INTERNATIONAL has 100% Success Ratio till now with Expertise of 17 years.